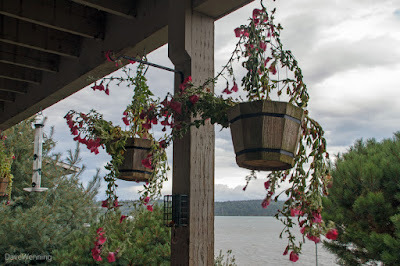 On Saturday, August 29, 2015 an unusual August windstorm hit the Pacific Northwest. While everyone's attention was focused on Tropical Storm Erika which more or less fizzled out, ours hit with a vengeance. 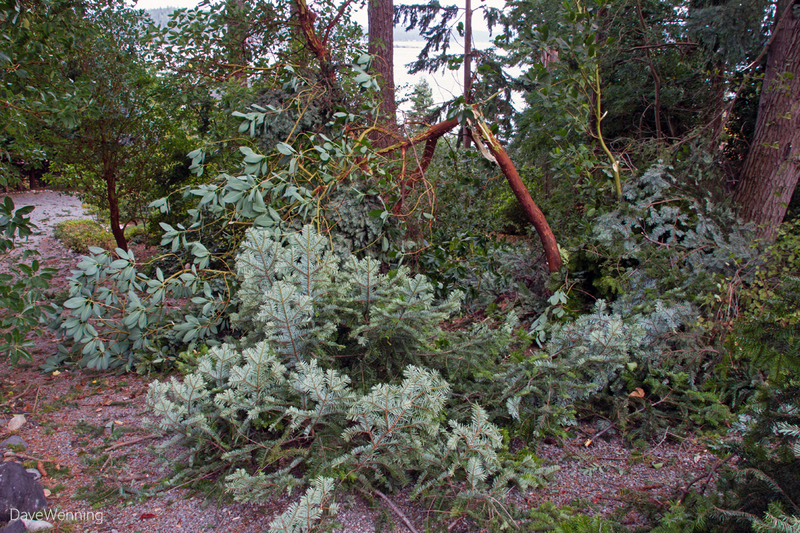 Washington, Oregon and British Columbia were severely impacted by unusually high winds brought by the storm. I was at work and missed the whole thing. Driving south on Interstate 5 at 6:00 a.m. I did encounter heavy rain, buffeting winds and tree limbs blowing across the freeway. But at that hour, the main front had not yet arrived. While at work, I checked the website occasionally to see if the power was still on. The last weather station upload was at 11:48 a.m. That coincides with the peak wind speed of 30 m.p.h. (48 k.p.h.) from the southwest at noon recorded by my station. That is not an excessive wind, but from that direction I have trees and terrain that effect the anemometer readings. The photo above of Skagit Bay was taken about 5:00 p.m. after I got home. 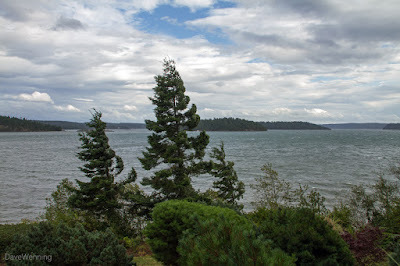 Although the storm had passed by then, it was still quite windy on South Fidalgo. Driving home after work, I found the roads littered with storm debris. Branches and entire trees had fallen, but had already been cleared off the roadway. When I got home, I knew the power would be out, but I didn't expect what I found in my driveway. Two large trees had fallen from the neighbors' yard. Some of my cherished Madronas that line the driveway had been destroyed in the process. At first it looked like I could handle this myself. Just beyond that broken Madrona, however, is the big top of a Douglas Fir. 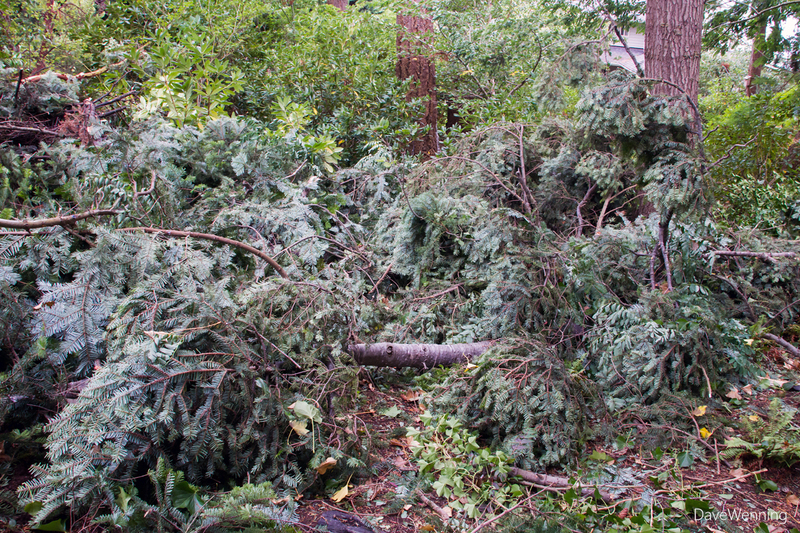 Luckily, I managed to book a tree service to come Saturday evening and get the driveway cleaned up. This is two views of what used to be my PNW Forest Floor Garden. There is a Pacific Dogwood in there somewhere. The Western Sword Ferns, Salal and Low Oregon Grape that were planted as ground cover had been coming along nicely. You can see what the garden looked like when first planted in this post. If reality had been the goal of the garden, I guess this is what a real Northwest forest experiences. There were two trees that snapped off about half way up the trunks. We have received much stronger winds here in the past. I believe the drought we have had over the summer rendered the wood more brittle than usual. 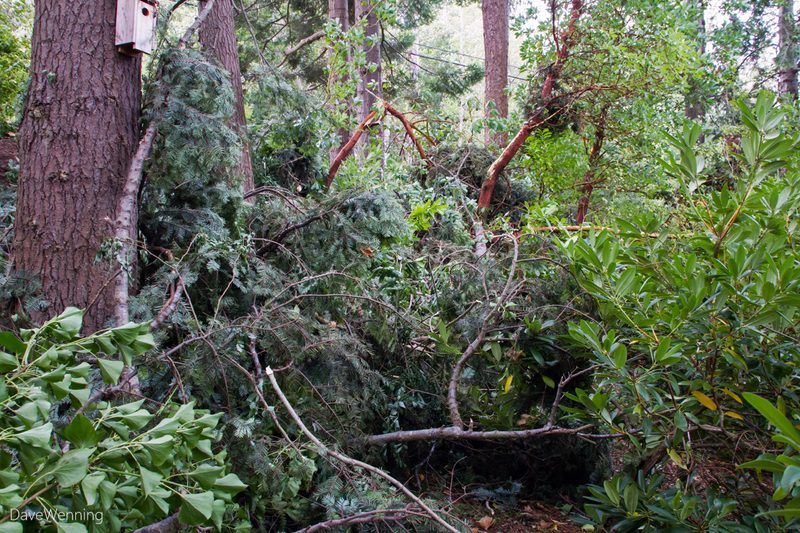 As a result, the trees were not able to withstand the force of a sudden gust of wind. Could this be a sign the climate change chickens are coming home to roost? 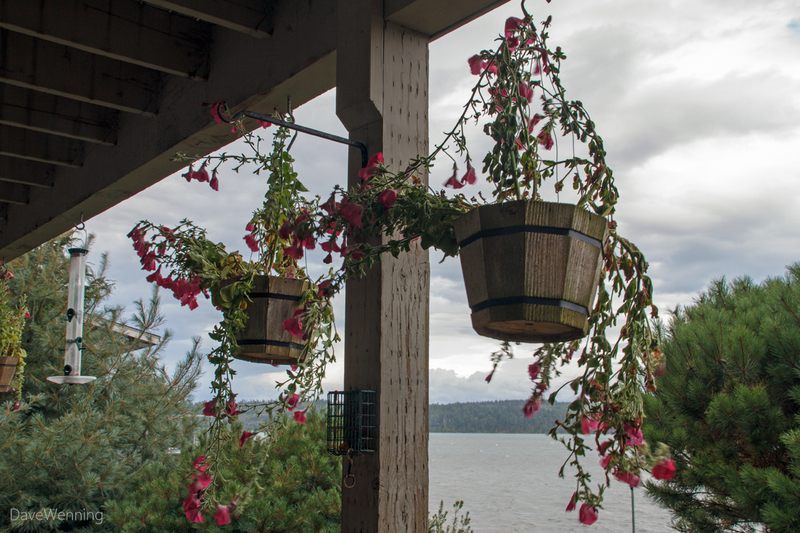 In the front yard, this is what is left of the hanging baskets in the basement patio. The birds managed to clean out the feeders, then disappear for a few days. Today (Tuesday) is the first day I have seen them back since the storm. After the storm, the weather has been very fall-like. 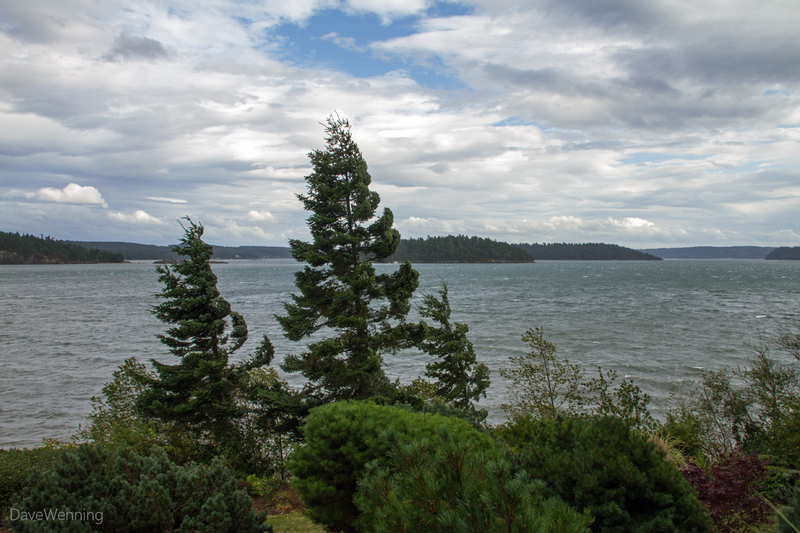 Today has been cool, rainy and overcast with a high temperature of just 60° F (15.5° C), For the most part, the winds have been calm. My power remained out Saturday night through Sunday evening. This meant going to work on Sunday in a more or less natural state. Nobody let on that they noticed. My Internet and cable TV remained out until late last night. That is why I am just getting to this post today. I do want to complement the United States Postal Service. Despite tempests, power and phone outages and roadways littered with storm debris, they managed to deliver the mail in the midst of the storm on Saturday. They also delivered my package from Amazon on schedule on Sunday. It's true what they say, "neither snow nor rain nor heat nor gloom of night stays these couriers..."
Here in Langley (30 min north of Bellingham) I didn't think the wind was much different than the usual winter storms we are used to (90-100kph gusts). Normally all those leaves aren't still on the trees, and we haven't usually had 4 months of near drought conditions. I think the leaves still made the biggest difference - the majority of the branches and trees I saw fallen around here were Cottonwood and other deciduous species. We had 750,000 customers lose power here in BC, and at one point 550,000 were out at the same time. About 10,000 customers still have yet to get their power back on. I think for many this was a bit of a wake up call as to how ill prepared they are for an actual disaster. Luckily I had power back on after 12 hours - so my two big chest freezers didn't even thaw. had an exciting drive home at the height of the storm from Lake Cav. Mostly alders and other deciduous trees and branches down. The most exciting, though, was crossing the 520 floating bridge mid-afternoon, wow!! car and bridge were buffeted left, right, up, down, and the standing waves against the south side of the bridge were huge! Fortunately I didn't lose power - I never do. Sorry about your garden and especially the madronas.